Whatever the occasion, this classic arrangement makes the perfect gift! Inside an elegant wire basket, your recipient will discover a well-balanced Sauvignon Blanc that's surrounded by an assortment of traditional gourmet snacks they'll find impossible to resist. Complete with hearty hors d'oeuvre crackers, smooth jalapeño-speckled cheese, and premium Virginia peanuts, this lovely gift is sure to delight the wine lover in you life! 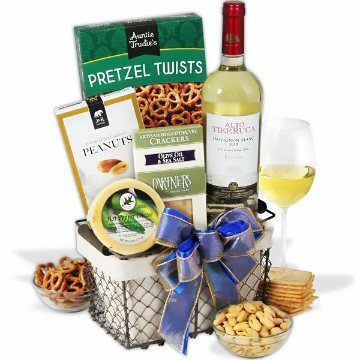 This gift includes the following: Sauvignon Blanc Reserva by Alto Tierruca - 750 ml., Olive Oil & Sea Salt Hors d'Oeuvre Crackers - .75 oz., Hot Pepper Cheese Round - 4 oz., Pretzel Twists - 3 oz., Roasted and Salted Peanuts - 2 oz.